A Bath and Some Wine...I Will Be Just Fine! 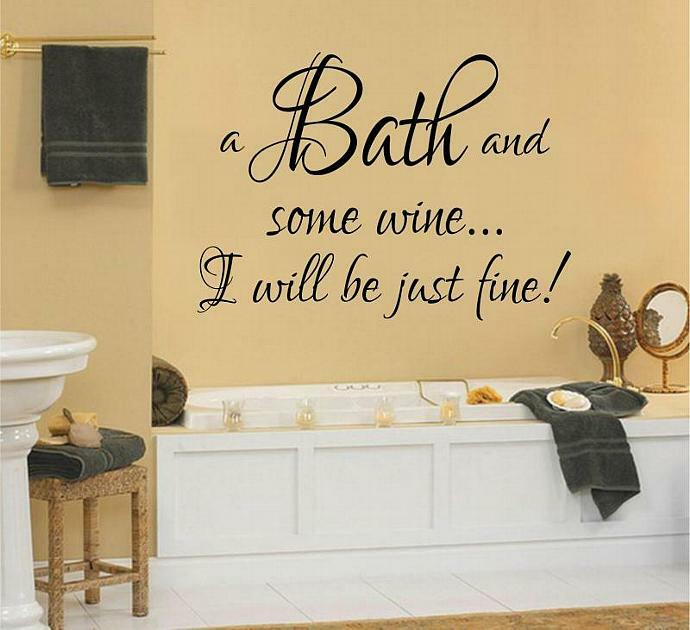 bathroom wall decal. This decal is made using a very elegant font often used in wedding decals. The font has highlight brush strokes that weave out of the larger letters. This listing is for the 42" wide by 28" tall listing. Just let em know if you would like to order one of the other sizes. The larger sizes of this decal will come in several parts to make it easier for you to apply to the wall. The measurements given are for the combined group. Individual sizes vary. The decal is shown here in a black color. You may choose and color you would like from our colors. Our color chart is shown in the 3rd photo. Please state your color choice in the notes to seller box during checkout. If no color is specified the decal will be black as shown in the photo. • Easy installation instructions will be included with your order, and are always available on my "shop policies" page.